I have lots of that shaving cream background left so I decided to use some of ut to cut eggs directly out of. I was able to get three eggs from each of two sheets. 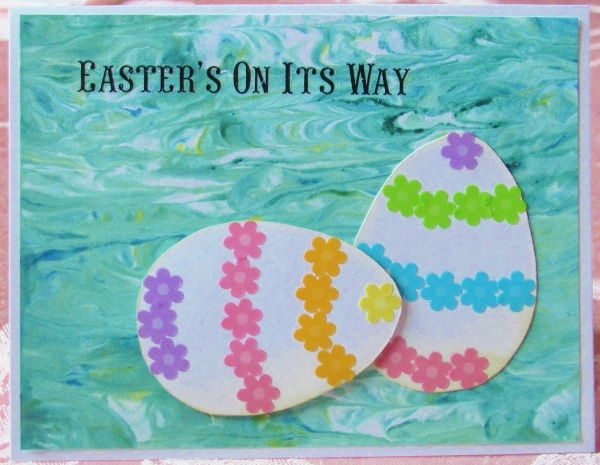 I decorated each of the eggs with white peel-off stickers and layered them on printed backgrounds. 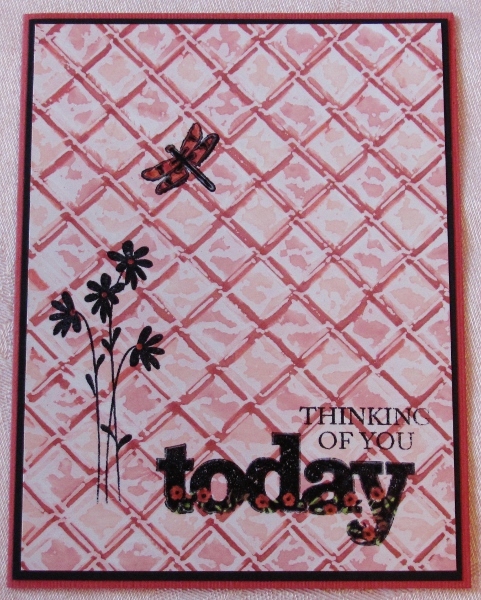 This card with a woodgrain background got a printed strip and a rub-on greeting. A more busy background with a dotted strip makes for a more lively picture. I used a gold peel-off sentiment. 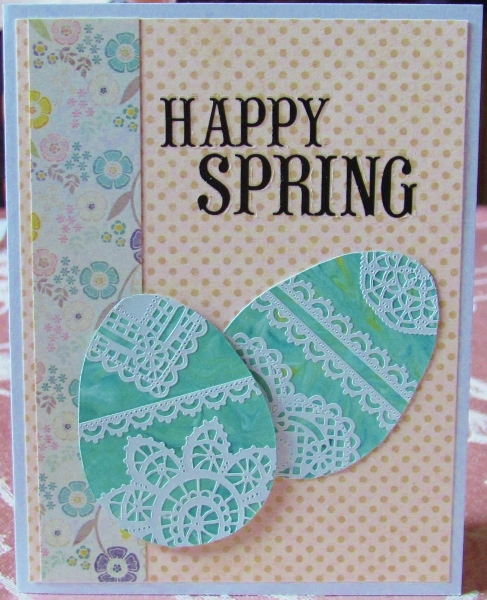 I combined two sentiment rub-ons for the last card featuring dots and a little flowered strip. On each of these cards, the let egg is mounted up on foam tape. When I cut the eggs out of the white on yesterday's cards I ended up with two whole eggs ready to add to a third card. BONUS! I used a bit of Distress to shade the lower edge and then decorated them with rows of little flower stickers. The right eggs is flat against the background while the left one is raised up on foam tape. I added text with a rub-on and placed the background on a white base card. 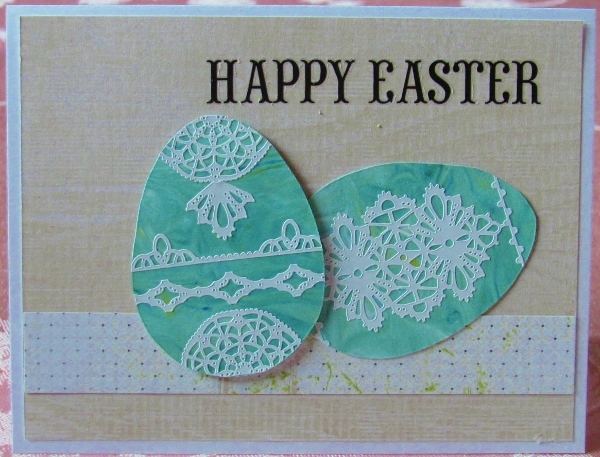 I saw an image of a card the other day with a colored egg on it and immediately had the idea of using some of the shaving cream backgrounds as the coloring for Easter eggs on cards. For the first ones I drew and cut out two eggs from white cardstock. Then I filled in the void with white peel-off stickers before attaching the piece over a shaving cream background. This one in landscape format was cut smaller to leave a wide border showing. The corners were then decorated with white sticker. On this portrait orientation I added white sticker borders to the two sides of the card. This one also got a silver peel-off sentiment. I'm still shaving cards off the stack of backgrounds. This one was pulled after I added that 4th color to the mix so it has a brighter green feel than the last two (which were more teal). I pulled some rose stickers that wre purple and peach and arranged them in a fall down the side. 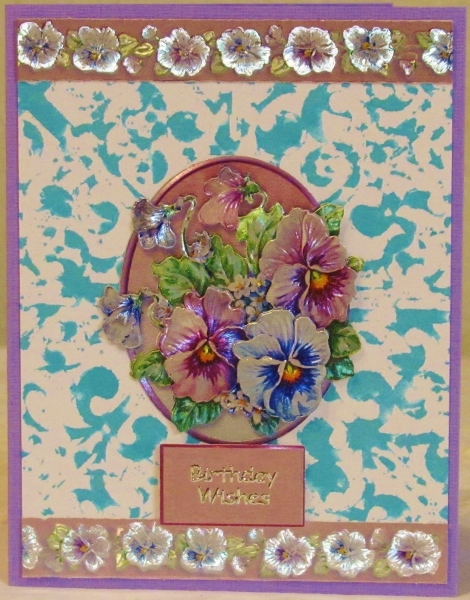 The silver peel-off sentiment sticker overlaps the blooms slightly making the design look integrated. The base card, though purple, is not nearly as bright as it appears. It actually matches the purple roses. The shaving cream backgrounds are back. On the one I used today I added a peel-off sticker white doily as the centerpiece. 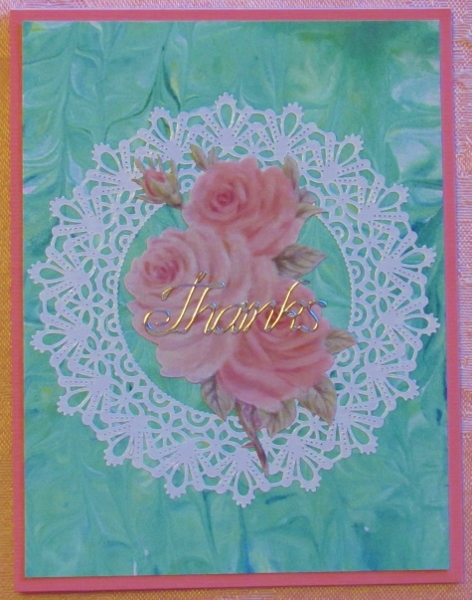 I had a pink sticker of a grouping of roses that was placed in the center of the doily. The base card I selected is pink to match the roses. A silver peel-off word provides the sentiment. 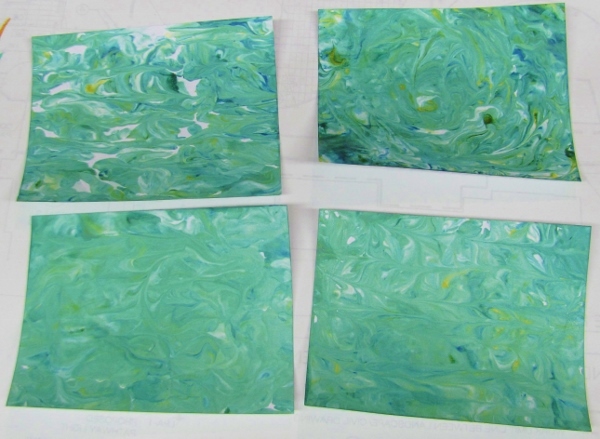 Remember those shaving cream backgrounds? I made some cards using them for backgrounds. Today's uses some vellum pansy stickers over a paper set in landscape. A bit of white peel-off sticker trim and a silver peelloff sentiment sticker make it look very feminine. 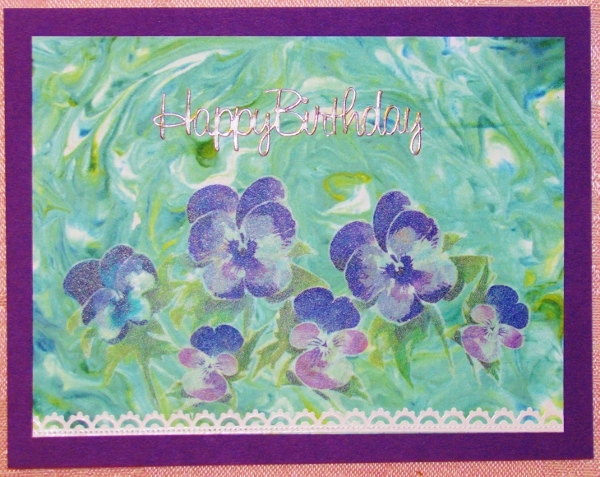 The purple base card reflects the vellum pansies. 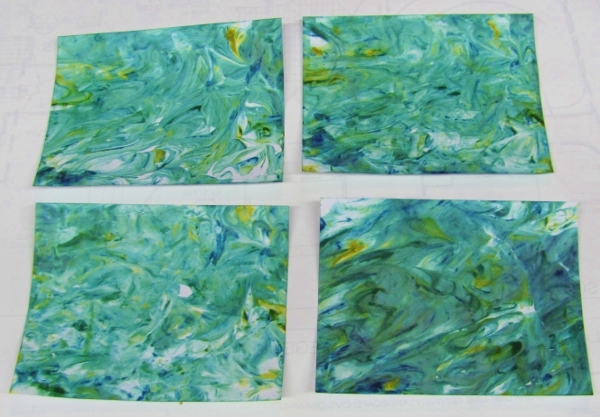 One of the groups I am on issued a challenge to use the shaving cream technique to create backgrounds and use them to make a card. Besides the tray, reinkers, shaving cream and a skewer you also need some cut pieces of white cardstock to 'print' on and some paper towels for cleanup. 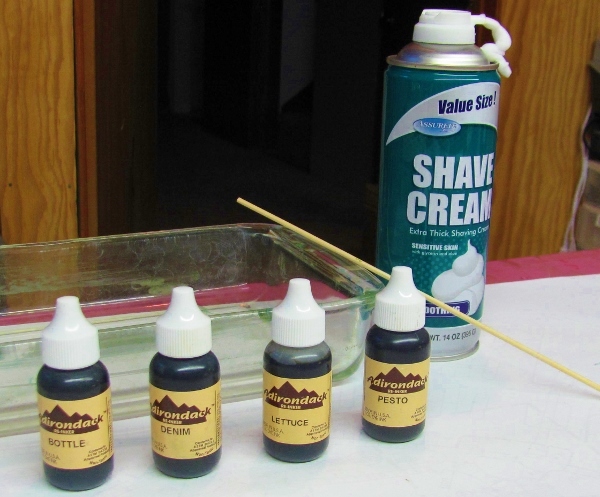 To begin, you spray the shavig cream into the tray and flatten it out with the skewer. Then you drip reinkers onto the cream and use the skewer to swirl it around. 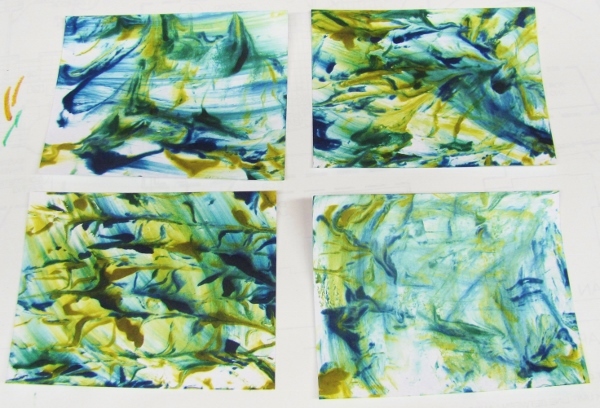 The cardstock is pressed onto the surface, lifted away and wiped off with the paper towel. 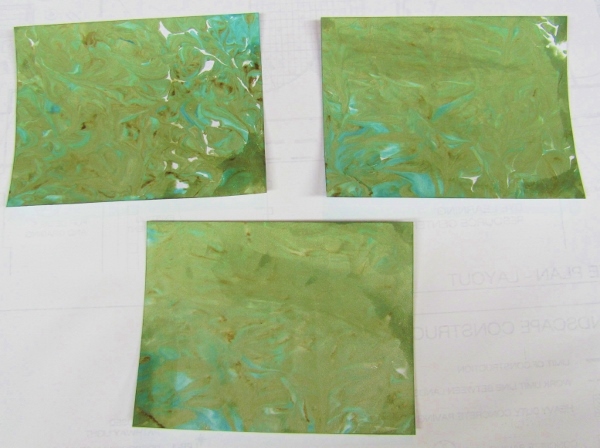 What is left behind is a marbled-look pattern on the cardstock surface. It works best to use harmonious colors of reinker so you don't get 'mud'. The first few 'pulls' may have ink that is too dark - mine did - but the more it is stirred and printed the more muted the ink will become. I ended up with 10 sheets of cardstock off of one shaving cream tray. LOTS more cream in the can so there is hope for more to come. I had one more of the stencil impressions, this one was a 'second generation' pull so it did not have as much ink on it. I decided to trim it down and use it 'as is' rather than trying to alter it. I used a foil 3D image in an oval and centered it on the background. I also used a coordinating strip from the foil sheet to border the top and bottom. There were four foil blocks in various colorings and I used one of these, raised up on foam tape, to display silver peel-off text. I placed this on a violet base card with a border showing all around. I went to a lot of trouble to create a great background and then covered it up! LOL! When I made the December 2015 'Tag' from Tim Holtz, I used a piece of white cardstock to blot off the extra Distress Stain from the stencil after spraying it. It's been sitting on my work table waiting for inspiration and this was the day. 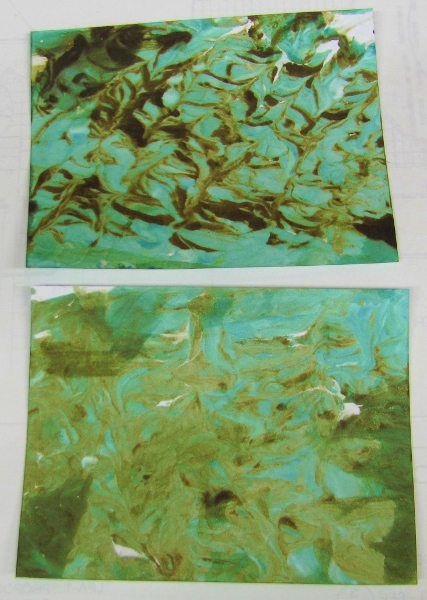 The Distress Stain had been sprayed through the stencil (blue in color) and the leftover stain stayed on the surface. 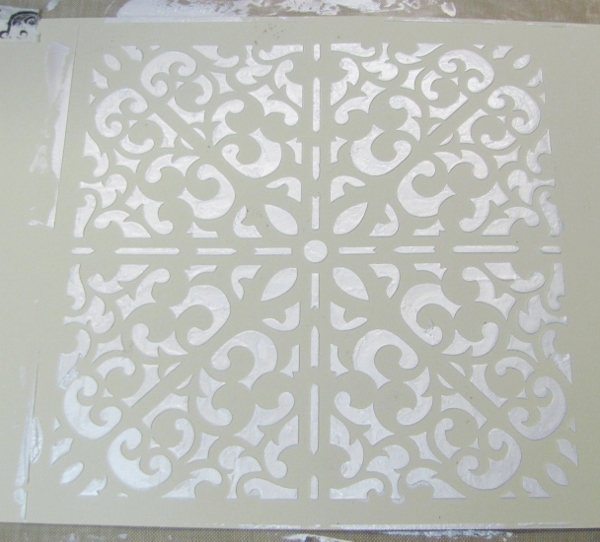 When the white cardstock was pressed onto it the stencil itself made the impression, not the holes in the stencil. The next step I took, after trimming the piece to card size, was to do a letterpress technique using picked raspberry Distress ink and a Cuttlebug folder called Ornamental Iron. I smeared the ink on the inside of the folder and centered the blue printed layer inside it. When it was run through the Cuttlebug the ink was transferred at the same time as the impression was being raised. This also made three colors as the blue original and the raspberry letterpress combined where they overlaid into a violet. The third step was to take a Distress Ink pad in Black Soot and swipe it over the top of the raised areas of the ornamental iron impression. I really liked the way this came out. However, it was pretty bright to use it on the card with the images I had chosen so I overlaid it with vellum to mute it. 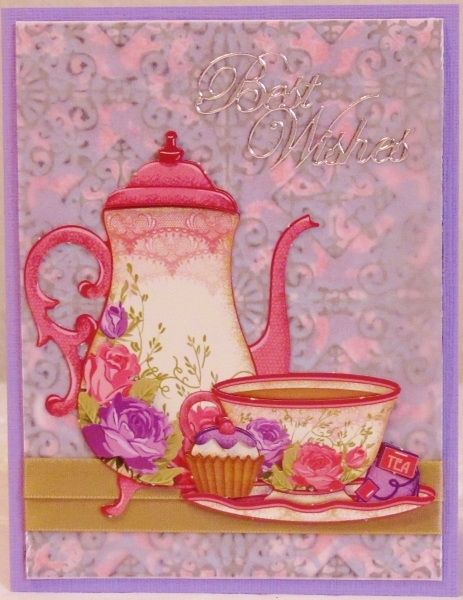 I added a 3D tea time image to the front with some ribbon across the bottom to serve as a table. 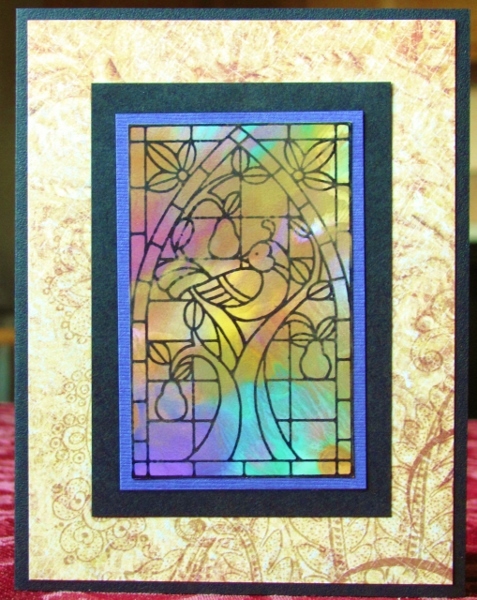 I mounted this on a violet base card and used a silver peel-off greeting sticker. Not done with the alcohol background yet. I had two pieces that were very close in appearance with great fall coloring and silver mixatives on the surface. Each of them was just large enough to stamp one of the large leaf images. I used Archival black to stamp the images and dried with a heat gun. I used small scissors and trimmed right up against the images. Now my idea was to run these cut leaves through the Xyron machine to apply a layer of adhesive and stick them onto a burgundy background. Unfortunately, I put them in the Xyron upside down and now I had adhesive ON THE FRONT! Aaaaaaak! In an effort to salvage them, I placed them on a sheet of transparency, applied adhesive to the back of the leaves and placed this over the piece of burgundy. To keep the edges down and not have adhesive showing, I scored the transparency at the edges of the burgundy and turned it to the back. This got stuck down with a line of adhesive and 'hooray' the leaves were saved! I finished this off by mounting it with foam tape over a sage green card base and adding silver peel-off word stickers for a sentiment. I wanted to keep going with the alcohol backgrounds and liked how that stained glass stamp was working. I have others of those types of stamps so I selected a background with a lot of gold mixative on it and a harvest stamp with a cornucopia. There wasn't a whole lot of color in the image so I chose a fall leaf printed paper and selected a bordering color from that. I also gave the image a wide black border for impact. This stamp runs landscape format unlike those for the last couple of days. The card today is SO much like yesterday's that it hardly needs all the descriptives and step-by-steps. I actually used the other half of the same alcohol background paper from yesterday. Some of the background had a 'good' section and other 'not so good' sections. 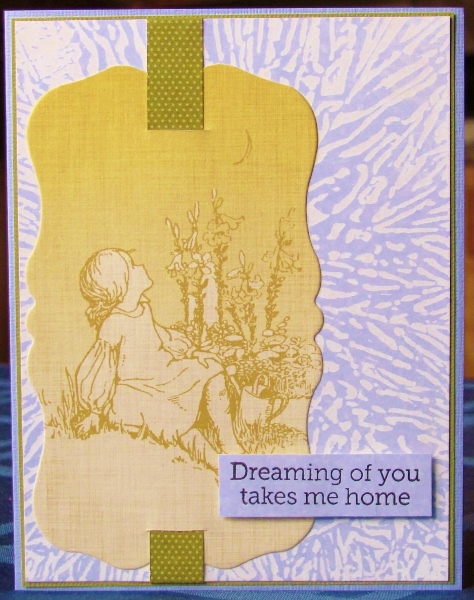 But this one was all good, allowing me to use both halves since the stamp was not too large. This background was a little darker so I chose a purple from the image colors for bordering. I repeated the black border as on yesterday's card and found a golden pring to layer behind it. This image has more metallic mixative on the surface which causes a glare with the camera. The image is NOT poorly stamped as the photo appears, that's just the camera. 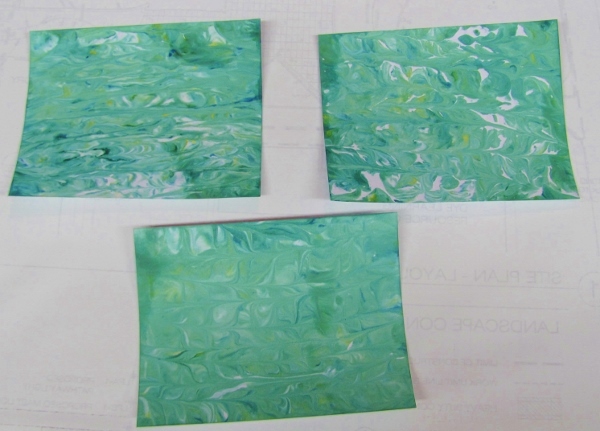 When I made the latest Tim Tag, I 'used up' the extra alcohol inks, mixatives and blender solution on the non-stick craft sheet by swiping through them with other pieces of glossy cardstock and set them aside for later use. 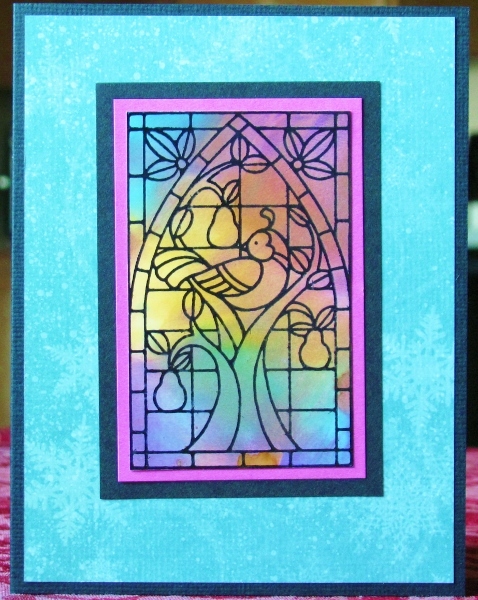 I took a piece with multiple colors and stamped it with a 'stained glass' stamp using Archival ink in black. I love how this really has the look of colored glass. 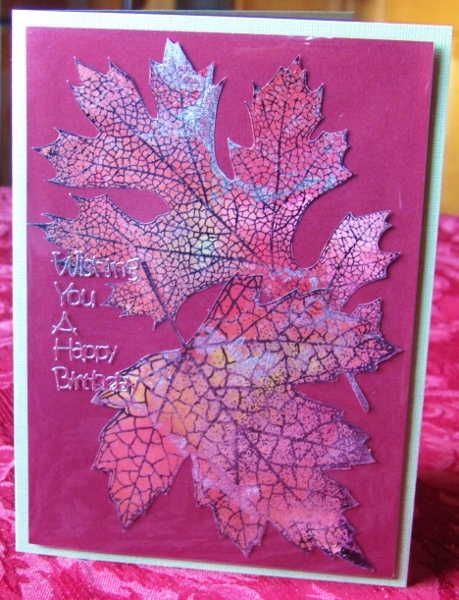 I chose one of the colors in the background and backed the trimed out stamp with this red-violet. A black border on this really gives the stamped image impact. 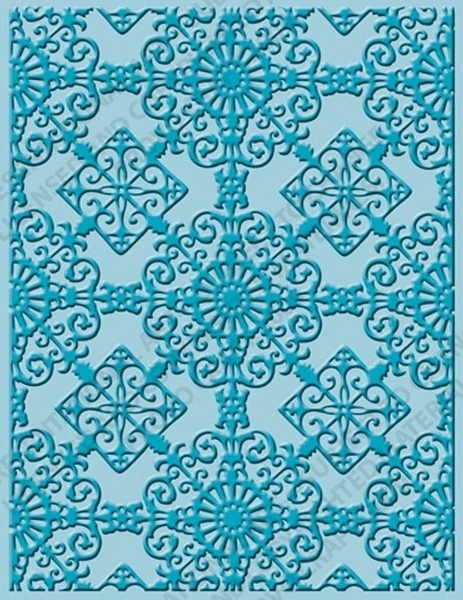 I chose another color from the image and found it in a printed snowflake paper. Placing this on a black base card while leaving a border showing makes for a Christmas card that will go out without a greeting. I was telling someone the other day about how to use waxed paper in a Cuttlebug folder to iron between glossy cardstock pieces and ink/buff for a great background. In the middle of the explaination I found that I had several pieces of this prepared cardstock so I demonstrated the inking step (to ooohs and aaahs). I used Shaded Lilac Distress ink. I didn't have an illustration to match the lilac but found a printed tag that looked good with it. I cut a slit in the top and the bottom and wove a strip of dotted paper through. 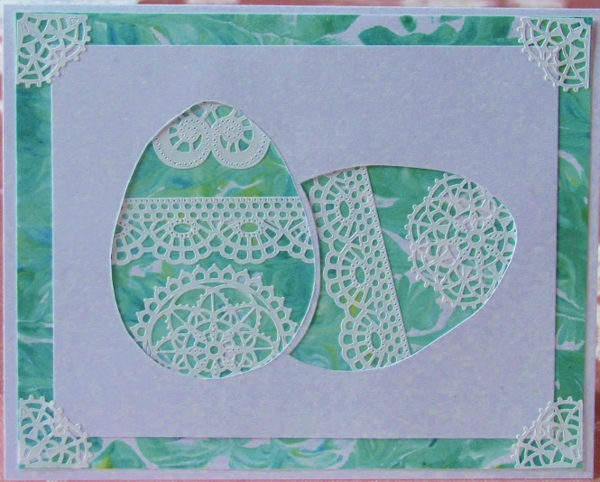 I gave the card a thin border of green and mounted it on a lilac card base. 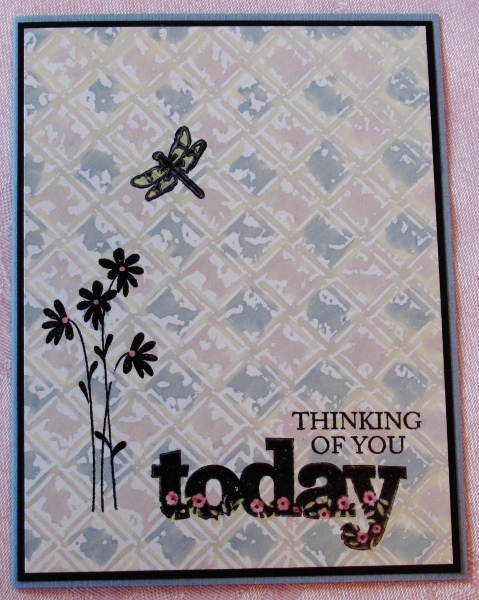 I had a pre-stamped sentiment on glossy cardstock. I used the lilac inkpad to color it to match the background and popped it up on foam tape. Another of the ColorMe papers I had on hand is imprinted with copper instead of white embossing. I decided to leave the background white and color just one set of the blooms. I used distress markers for this. 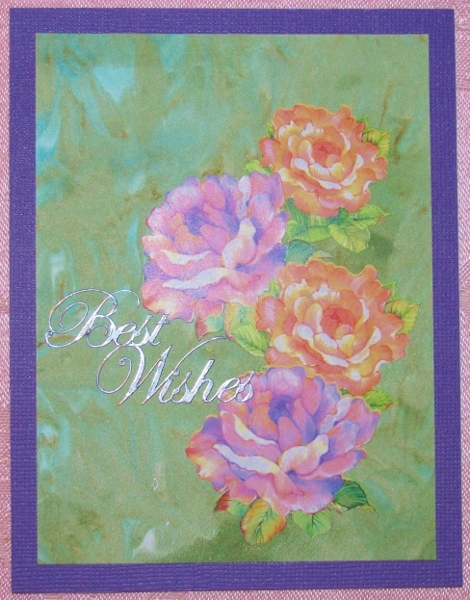 I echoed the colors by bordering with canary yellow over a rose card base. The sentiment got stamped on green and a flag end cut. 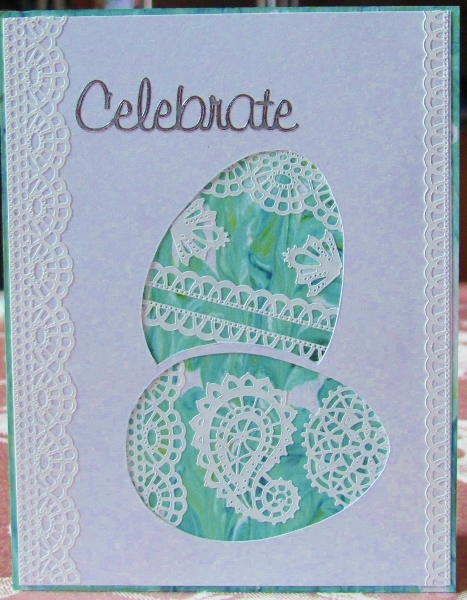 With another piece of the ColorMe paper I used distress ink to color over the whole front. I started to add a darker color just to the butterflies but as it started to smear outside the images I just continued to blend it into the background and really was pleased with the effect. Ooooh, yummy! 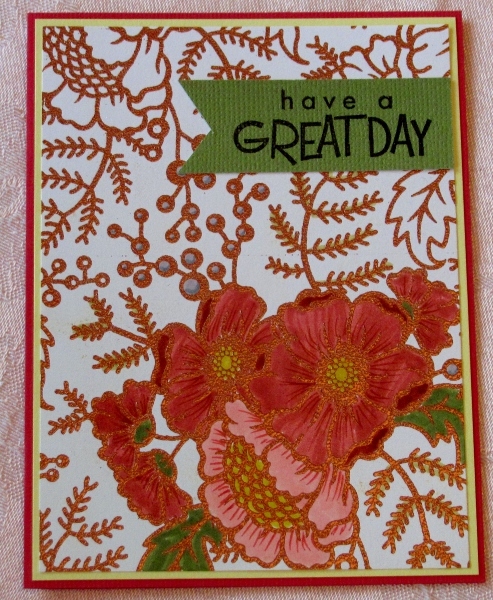 I stamped the sentiment on apricot and bordered it in red to echo the background. A white border and orange card base bring it all together. I pulled out another piece of the butterfly ColorMe paper to play with. 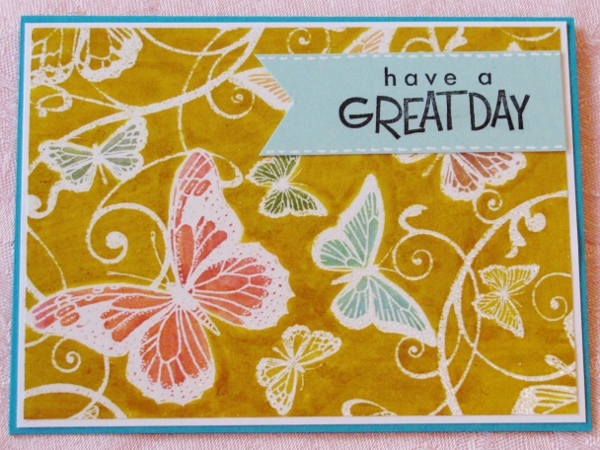 This time I used distress ink pad to color the whole thing and then went back in with color for the butterfly. I added red distress pad to add some dimension to the background. 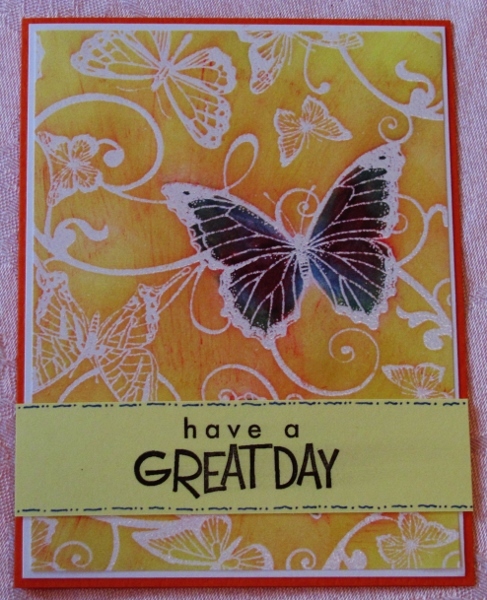 I added a white border and orange card base then stamped the sentiment on a strip of canary yellow card. After adhering I added doodle lines with a fine line blue Sharpie. I had some large (12 x 12) sheets of ColorMe papers and decided to cut them down into card-sized pieces. This gave me 6 pieces from each sheet. 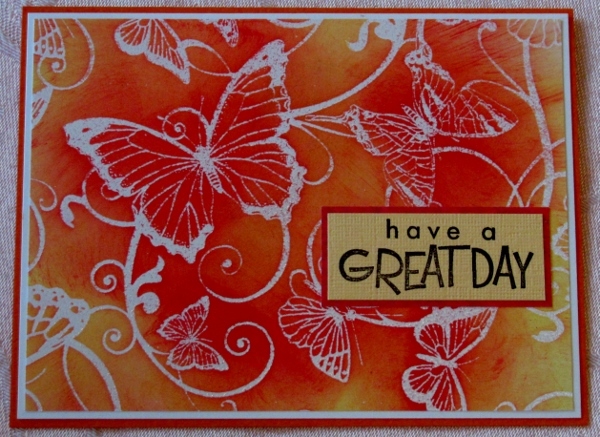 I selected one that had white embossing on white paper, imprinted with butterflies and swirls. I used markers to color each of the butterflies and then the background. A buffing with a rag brings all the embossing back to white. 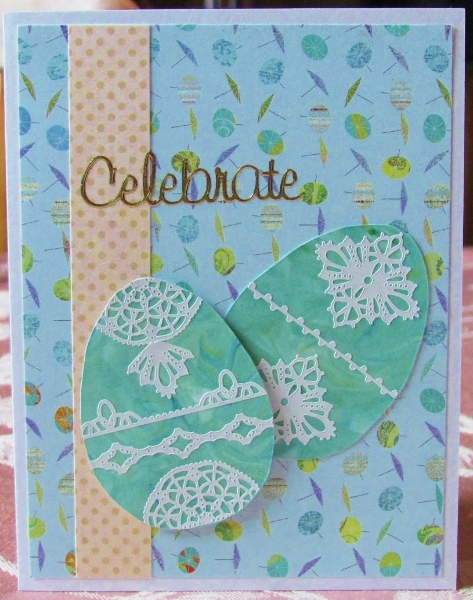 I used a white border over a teal blue card base and then stamped a sentiment on teal green. I cut a flag end on the left and drew in some dashed white lines before adhering. I liked this set of two backgrounds so much that I did not want to cover them up. I decided to mount a combination of small stamps together on an acrylic block to create a little scene with lots of open space. I used markers to color in the dragonfly, the flower centers and the floral graphics in the large word stamp. Mountings are on coordinating card bases under black bordering.